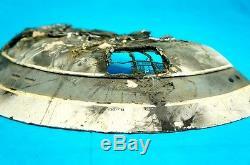 Star Trek III Search of Spock ENTERPRISE MODEL section ILM screen used prop COA. Paramount / ILM, Industrial Light & Magic. About : 42,5cm x 22cm x 5cm. Original ENTERPRISE miniature model, Bridge Section, used during the production of the movie Star Trek III "The Search for Spock". This model comes from a person who worked at ILM, Industrial Light & Magic, upon the completion of filming. The section is a very, very detailed example see pictures! Of visual effects techniques of one of the most popular science fiction franchises in the history of movies and television. It is made in resin and plastic, with many parts in METAL! Comes with the original Letter of Authenticy from the first owner and our photografic C. The item "Star Trek III Search of Spock ENTERPRISE MODEL section ILM screen used prop COA" is in sale since Monday, February 06, 2017. This item is in the category "Entertainment Memorabilia\Movie Memorabilia\Props\Originals"." and is located in Hawthorne, California. This item can be shipped worldwide.